Join CIRDI and UBC SPPGA for this book talk by Dr. Nathan Andrews, author ofGold Mining and the Discourses of Corporate Social Responsibility in Ghana, with welcome remarks from Dr. Nadja Kunz, Assistant Professor at the School of Public Policy and Global Affairs (SPPGA) and the Norman B Keevil Mining Engineering. Resource extraction (and the distribution of resource rents thereof) is usually intended to bring positive developmental outcomes when the rights conditions prevail. Ghana’s century-old mining sector is yet to experience such positive contributions of the industry to both the communities directly impacted by mining and the nation-state as a whole. 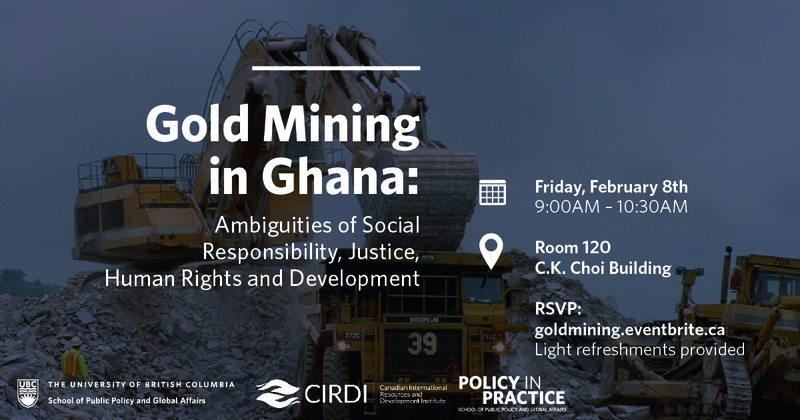 Based on the recently published book, Gold Mining and the Discourses of Corporate Social Responsibility in Ghana (Palgrave Macmillan, 2019), this talk will explore the scope, nature and relevance of corporate social responsibility (CSR) in Ghana with the objective of highlighting how CSR works more to the benefit of the global corporation than local communities who are the purported beneficiaries of such efforts. It will also offer suggestions on how things can be reversed to the benefit of affected communities. Bio: Nathan Andrews is an assistant professor in the Department of Global and International Studies at the University of Northern British Columbia, after having completed his tenure as a Banting Postdoctoral Fellow at Queen’s University in August 2017 during which time he was also one of the three shortlisted scholars for the SSHRC Talent Award. His ongoing research examines the international political economy/ecology of resource extraction and he is currently undertaking a new SSHRC project that examines oil and its livelihood impacts on small-scale fishing communities in Ghana and Mexico. His research has been published in journals such as World Development, Resources Policy, Business and Society Review, Energy Research and Social Science, Third World Quarterly, and Africa Today among others. Dr. Andrews has also co-edited different volumes, including Corporate Social Responsibility and Canada’s Role in Africa’s Extractive Sectors (forthcoming with University of Toronto Press, 2019).